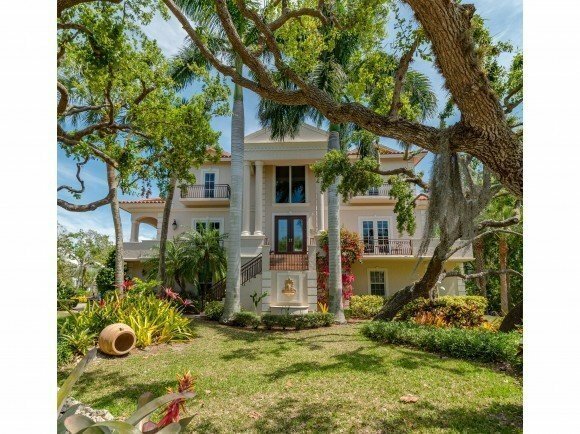 This Spectacular Estate Home in Hideaway Beach sits on an extra-large lot and offers stunning upgrades with exquisite details that will please the most discriminating buyer looking for quality! Thoughtfully designed 3-story Custom Home features: lovely golf course views, soaring ceilings, winding marble staircase, gourmet chef's kitchen, breakfast and family area, wet bar, a formal dining room, 5 bedrooms plus den, 4 1/2 baths and a Bonus/Hobby room with 2nd laundry area, pocketing sliders which open to an expansive outdoor entertainment area including a built-in grill, balcony/patio with a staircase leading to the pool and grounds, private elevator, beautiful lush tropical landscaping and a custom designed pool. Perfect location within walking distance to the Beach and Hideaway's World Class Amenities of Gulf front clubhouse with formal and casual dining, resort style pool, new beach side Sandbar, fitness center, tennis, golf, bocce, pickle ball, picnic area with kayaks, paddle board storage and 24 hour gated community.